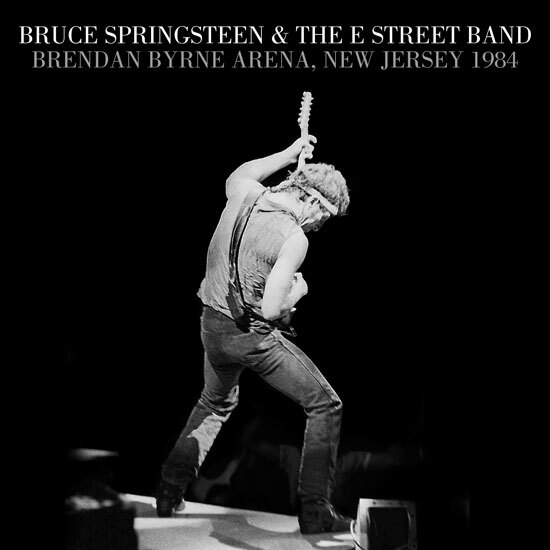 Let’s talk about Springsteen’s latest archive release, Brendan Byrne Arena (a.k.a. Meadowlands), August 5, 1984. This was the opening of a 10 concert sold-out stand, the band’s 20th show of what would become a 16-month tour. The lineup had changed: Steven Van Zandt had moved on, Nils Lofgren and Patti Scialfa were hired to replace him (neither has much presence on this release; at this relatively early point, their vocals are mostly tentative and Nils’ guitar sound in the mix is largely subsumed by keyboards and bass.) The concerts on this tour provided seventeen tracks for the Live/1975-85 set, although none came from this concert. I’m glad. As the audiences grew larger, the arrangements got tighter and the sound became monolithic, Springsteen’s goofy joy seemed to fade. The Meadowlands seated around 20,000, quite large but not yet the 50,000+ he’d be projecting to within a year. To be fair, I can only think of three performers capable of mesmerizing a crowd that size on their own, without significant technological distraction – Mick Jagger, Billy Graham, and their unholy love-child Bruce Springsteen. Toby Scott’s entire job lately seems to consist of bringing joy to Springsteen fans. Back in 1984, we waited years between Springsteen releases and now every six weeks brings another gift, miraculously cleaned up, mixed and presented whole. The fussy perfection of the Live 1975/85 set wasn’t as satisfying as these concerts, which are all imperfect yet somehow shine even brighter because of the few dud tracks. Nobody in rock music constructs a better setlist than Springsteen, and he changes it up every night. The very best way to experience Springsteen is to listen to one of his concerts start to finish, and ride the ups and downs to the inevitably ecstatic conclusion. The Springsteen Live site has the technical details, plangent process 24-track blah blah blah (interesting to read once), but here’s what you need to know: Brendan Byrne Arena, New Jersey 1984 sounds incredible. It’s like being there, first section center, without the hassle of traffic and lines and somebody spilling beer on your shoes or clapping on the off beat. Three songs from Nebraska are played early on: Atlantic City, Johnny 99, and Highway Patrolman. These are gorgeous and powerful, particularly Highway Patrolman, which might be the definitive version of this song. But there’s more. The best rendition from Nebraska, and one of my favorites from all of the archive releases so far, is Used Cars. Springsteen dedicates the song to his parents, who are in attendance. Where the album version is low key and defeated, this one is gently nostalgic, buoyed by accordion, mandolin and twinkling glockenspiel. The real dud here is Cadillac Ranch, driven by what sounds like a circus organ that grates like Woody Woodpecker’s cackle. I’ve never heard this song so far off the mark – here, I can begin to understand critic/biographer Clinton Heylin’s disdain for it. My Hometown is a bit strident (the song doesn’t breathe enough with Max’s metronomic bass drum under the opening verses.) Born to Run is well on its way to becoming the museum piece it’s been ever since. The stretch of eight songs from No Surrender through Jungleland would make a wonderful stand-alone album. They include a delightfully storied Pink Cadillac, a lilting Jersey Girl and my favorite-ever band introductions on Rosalita (soon to be semi-retired, dropped from the setlist on October 19 for the first time since 1974.) The playing is top-notch, the stories are funny, Springsteen is loose, and together these eight tracks demonstrate everything fans love about the performer, the songwriter, and his band. The stats: 29 songs; 3 hours, 16 minutes; average song length 6 minutes, 45 seconds. Album breakdown: Greetings-1; Wild-1; BtR-5; Darkness-3; River-4; Nebraska-4; BitUSA-6; Non-album-1; Covers-4. The verdict: A classic, well-presented. The man himself became inscrutable in the 80’s but he made some great music, and he’s without peer as a live performer. Each release in the archive series makes every other release more interesting – individually enjoyable, but indispensable as slices of the artist’s history.